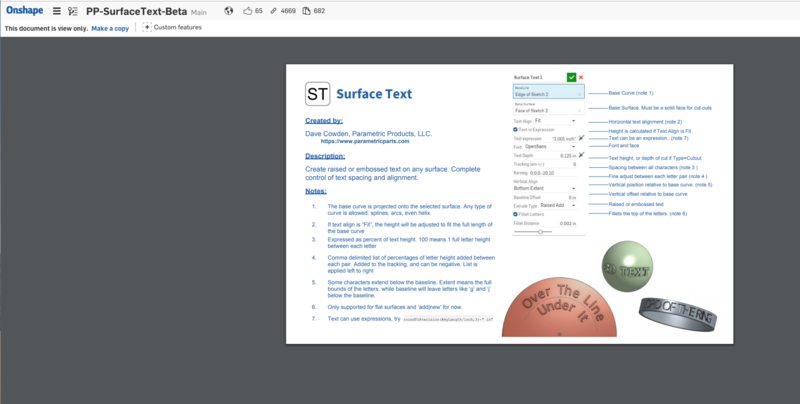 How do you add in a Feature Script into OnShape, ie; Surface Text? Hi all. I'm somwhat new to Onshape and went through a class to learn it but have come across a situation that I can't find the answer for. I'm sure it's a simple one that just wasn't explained in detail to our class. What I am trying to do is add a text box with text in it in a half moon flat configuration somewhat like the lettering on a tire or top half of a doughnut. I've seen about the Surface Text Feature Script but I don't know how to use it or add it in my document. Please help me solve this issue and all will be right with the world. Thanx in advance. Once you press that button you will see a list of the features that this document supplies, and you can click on the ones you want to add to your toolbar (In this case there is only one). Once you add the custom feature to your toolbar, you will be able to use it like any other feature, in any document you can edit. All the way at the very right side of your toolbar there will be a dropdown with all of the custom features you have added to your toolbar, and you can use them in the same way that you use other features.